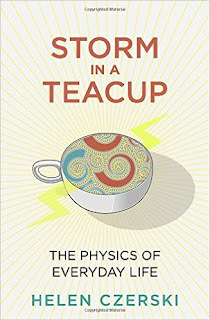 As 2017 has just started it might seem presumptuous to claim that Storm in a Teacup: The Physics of Everyday Life will be one of the best books of the year, but I will be very surprised if it doesn’t end up high on a number of such lists over the next twelve months. Helen Czerski should be familiar to frequent watchers of science programmes on the BBC as she has hosted a few and has been a panel member on others. She is a lecturer in physics at University College London, specialising in the field of bubbles. The book aims to show the incredible amount of science that surrounds us on a daily basis and how that seemingly mundane science is an expression of far grander things on a terrestrial and cosmic level that follow the same basic principles. 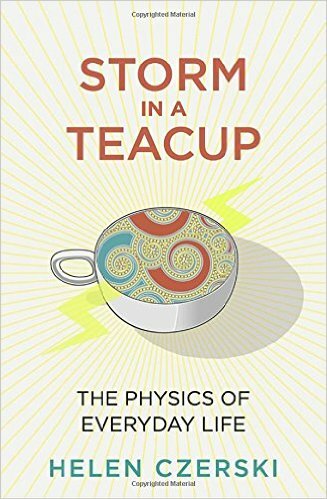 What I found excellent about this book was the adeptness with which Czerski moves from the physics of the everyday to a description of how a fundamental force works. An example of this is the section of the book discussing waves where she uses a toaster as a starting point for discussing the transformation of heat into light and how colour is a function of temperature. The book is chock full of interesting scientific explanations for everyday occurrences and ways to use science to overcome some of life’s little difficulties, such as why ketchup often gets stuck in bottles and how to get it to flow in controllable way. She also includes lots of easy and fun small experiments that one can do at home to demonstrate physical properties and why they work the way they do. An example of this is her tip of an easy way to tell a boiled egg from a raw egg. What makes the book stand out is that it is just as fun to read for a person who has read a lot of science literature or has a scientific background as it is for someone with limited experience of popular science. The book is full of interesting facts and examples that easily pull the reader further into well-written explanations of fundamental physics. It is very hard to say anything negative about Storm in a Teacup other than that the description of why a wave always lines up straight when coming into shore is a bit confusing, and possibly wrong, as I tried to diagram her description numerous times and constantly came to the opposite of her description - but I’m being very nitpicky here. I certainly hope that she plans to write more books about physics and science in general because she has a real knack for explaining the complex in very accessible and interesting ways, and she is an excellent writer. A great book with which to start off the new year.